Scottish twee is a regional genre of which I am a frequent listener: Shop Assistants and The Pastels helmed the scene in years gone by, and, most recently, Camera Obscura have taken the lead after years of Belle and Sebastian's making the most popular twee sounds around. There has been a lull in Belle and Sebastian's production of music since their 2006 album The Life Pursuit. In that span of time, leader of the pack Stuart Murdoch has been steadily working on his God Help the Girl group/story/film project. However, Murdoch's fans would not be appeased by a new project; they sought a Belle and Sebastian record. Thankfully, Murdoch and his old friends are getting back together and are in the process of finishing new music, promising fans a tour and a new album. A fresh album of jaunty, sweet songs is on the way. A release date has not been announced yet, but the promise is what counts. Dear readers, this has been my final Art Rock post. It has been amusing to watercolor in the indie news that I follow so closely, putting to paintbrush the wealth of otherwise un-useful, obscure music trivia that I have been gathering. I have come away with a portfolio of portraits of people most of whom will not be recognized by name --let alone by face -- by the general public. So, if you happen to be a dedicated fan of any of my illustrated musicians, or any other in the indie category, I would happily take commissions. If you ask me, the weather is unbearably hot, and recreationaly drying in the sun is not my cup of iced tea. Summer is not my season, and any beach is the place I like the least. But summer songs -- when played in air-conditioned quarters -- do allow me to escape my angst and enjoy what the summer has to offer: sugary, nostalgic tunes. Best Coast's songs add a dirty dose of angsty lo-fi to California pop. Start with "When I'm With You." And if it's not stuck in your head after one listen, you don't know catchy. Best Coast, led by Bethany Cosentino, is releasing its debut album in the summertime after plenty of sunny singles. A pastel boombox, some plastic sunglasses and this yet-to-be titled album may just reverse my mean streak and make me think twice about beachcombing. Yes, dears, I realize that much of this week's focus is on The Arcade Fire--that flock of multi-instrumentalist Canadians who recently released tidbits of a few new tracks from their desperately anticipated third full-length album. But I find it impossible to pass up the chance to illustrate an afro or discuss intriguing collaborations, and The Roots have offered up a two-for-one offer. Thank you, sirs. The Roots' forthcoming album, How I Got Over, is set for release on June 22 via Def Jam and is expected to feature a host of enthralling artists. Most recently, Dirty Projectors' gorgeous singers and harmony specialists, Amber Coffman, Haley Dekle and Angel Deradoorian, were pictured hanging out in the recording studio in a Questlove-tweeted video. And this collaboration comes as no surprise for those of us who have seen the video he previously shot of Dirty Projectors backstage at "Late Night with Jimmy Fallon." These girls mesmerize with their fantastical webs of harmonies, and Questlove was rightfully impressed. Also slated for appearances on the album are the captivating -- and previously illustrated -- Joanna Newsom and the two-band man Jim James (My Morning Jacket/Monsters of Folk). The benefit of being a late-night talk show house band is now clear: it comes with the chance to gain the contributions of the show's musical guests on your latest record. Well, at least if you're a respected group like The Roots, there's a chance that that plan might work, and it has for them. They are some smart fellows. M.I.A. knows how to promote an album. Drop a dance floor single, release a graphically bloody music video and speak a few unfavorable words about the most famous pop stars in the world. The album, due July 13, seems to be called /\/\/\Y/\ -- a needlessly confusing reference to her offstage name, Maya. It will be released on Interscope and her own imprint, N.E.E.T., whose Website showcases a chaotic conglomeration of graphics and moving images that creates the effect of being hit in the face with a parade and a vat of candy. Witnessing it is a fascinating but troubling colorful experience. The dance floor single, "Xxxo," is available now for download. Bringing that '80s shiny, electronic sound, it is unbearably catchy. It sounds much unlike "Born Free" -- the gritty single that came packaged with a controversially violent video only weeks earlier. Oh, and those celebrity conflicts of note involve Justin Bieber and Lady Gaga. M.I.A. also knows how to go for the jugular of popular culture. Antony and the Johnsons' album covers can be collectively recognized for their black and white, stark, almost lifeless photographs that are as evocative as Antony Hegarty's tremulous vocal delivery. If you witness the cover of their 2009 full-length The Crying Light, which showcases the contorted figure of Butoh dancer Kazuo Ohno, you will realize the visual equivalent of the band's shadowed torch ballads. But with the release of the band's new record, Swanlights, the mood seems to have shifted. Or -- at least -- the visual image of that mood has. Swanlights, which is planned for released on October 6 via Secretly Canadian, is covered in a color-tinged collage and charming cursive handwriting. The collage may be of a bloodied polar bear, but the image still does not seem as troubling as the colorless portraits that cover their previous albums. Special editions of the album will also come with a 144-page book of Antony's artworks and writings. Crafted by an alluring artist, the book will surely be somber and beautiful. Kele Okereke is best known for being the vocalist and guitarist for the lovelorn yet oh-so-dance-crazed British pop band Bloc Party. But now Kele can add solo artist to his pop résumé. He is releasing a solo album, The Boxer, June 22 via Glassnote, and lucky for eager listeners, the first single has been released to the public. It's called "Tenderoni" -- a name that one would think would otherwise baffle iTunes but, in fact, more than one separate result is gained. Just try it. Anyway, back to this specific song named "Tenderoni." Producer XXXchange of Spank Rock supplies a pulsating electro track to support Kele's vocals, which on more than one occasion spell out the peculiar song title. This song would fit right in at any sweaty disco where the people are colorful and the beverages are strong. People went nearly mental over Grizzly Bear's album Veckitamest last year. And for good reason. It is a meticulously crafted, beautifully serene and creative album. But one year prior I was thoroughly impressed by Department of Eagles In Ear Park -- an album I prefer over Veckitamest. 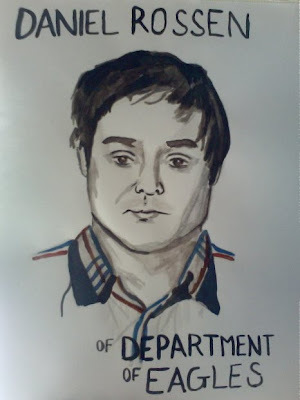 Daniel Rossen, the second-in-command of Grizzly Bear and the first-in-command of Department of Eagles, creates songs with more energy than could have been expected from a Grizzly Bear album prior to Veckitamest's release. I think it was the extra dose of Rossen that made that album such a hit. Needless to say I was quite excited when I heard that Department of Eagles is releasing another album. Due June 20, this album will be comprised of never-before-released (but not new) material. Archive 2003-2006 is a collection of songs and sounds Rossen and fellow Eagle Fred Nicolaus recorded after their 2003 debut The Cold Nose and prior to In Ear Park's 2008 release date. "Brightest Minds" is the first track off the record that can be heard. It is a drum and piano-driven folk number with Rossen's soulful, raspy voice leading the way. If the whole album is as exciting as this song, it is sure to be another winning one. Art Rock, written and illustrated by Jessi Finn, is a blog that adds color to the latest goings-on in indie music. Each week the blogger presents a new piece of artwork inspired by timely events.